Dr. Fredric H. Schmitz has been selected to receive the Alexander A. Nikolsky Honorary Lectureship. The Lecture will be delivered at the 65th AHS Annual Forum and Technology Display at the Gaylord Grapevine Resort and Conference Center in Grapevine, Texas on Wednesday, May 27, 2009 at 4:00 p.m. The Lectureship is awarded to ?an individual who has a highly distinguished career in vertical flight aircraft research and development and is skilled at communicating their technical knowledge and experience.? In winning the award, Dr. Schmitz joins the ranks of previous distinguished Nikolsky recipients including Dr. David Peters, Dr. Ken Rosen, Troy Gaffey, Dr. Richard M. Carlson, Professor Howard C. Curtiss, Jr., Dr. Daniel P. Schrage, David Jenney, Evan Fradenburgh, Kenneth I. Grina, Robert R. Lynn, Rene Mouille, Professor Alfred Gessow, Bartram Kelley, Robert Huston, Bruno Lovera and Professor Barnes McCormick, Jr.
Dr. Schmitz was nominated based on his long and distinguished career that has exemplified the highest ideals, goals and achievements in the field of helicopter and V/STOL aircraft engineering and development. 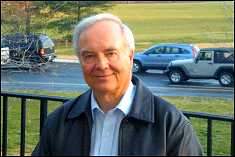 He currently is Professor for Aerospace Engineering at the University of Maryland?s Alfred E. Gessow Rotorcraft Center. In his 35-year career, Dr. Schmitz first worked for Boeing Helicopters for two years, then with the U.S. Army Aeroflightdynamics Directorate for the next fifteen, joining NASA as the Chief of the Full-Scale Aerodynamics Research Division rising to the level of Director of Aeronautics of NASA Ames, and subsequently joining the University Maryland as the Martin Professor of Rotorcraft Acoustics. In addition, he has educated and mentored many students at the University of Maryland and Stanford University during these years and these individuals are now working in key positions in government, industry and in universities.